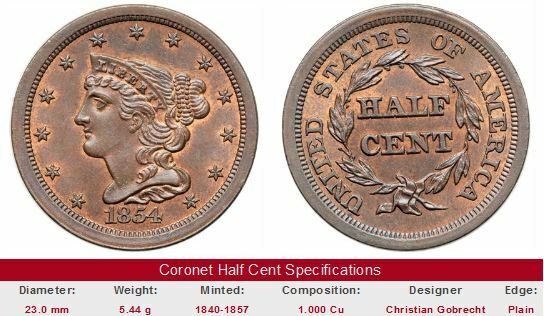 Once upon a time, long ago, a coin worth a half cent in face value could actually purchase something worthwhile. 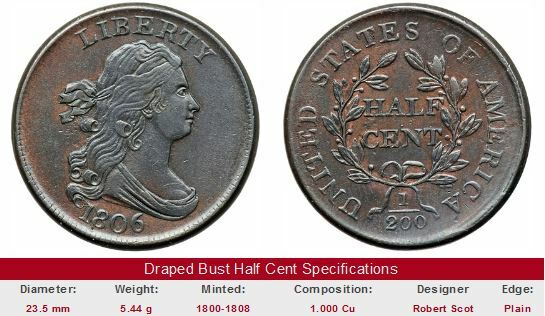 The Half Cent was one of the earliest United States coins to see duty, first minted in 1793, just as George Washington was settling into his second term as President. In those days, an average workman could hope to earn only about one dollar a day, so the Half Cent was indeed a useful denomination in daily commerce. People will not take the trouble to make a cent with two pieces of money. 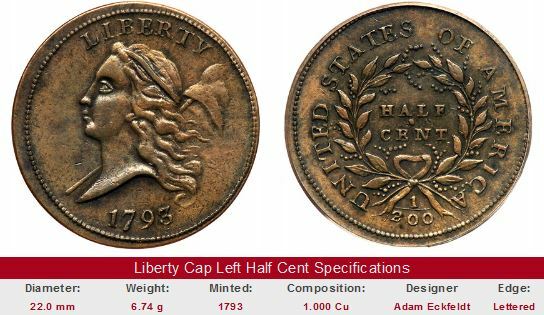 What's more, higher copper prices and increased labor costs made the Half Cent unpractical to mint. 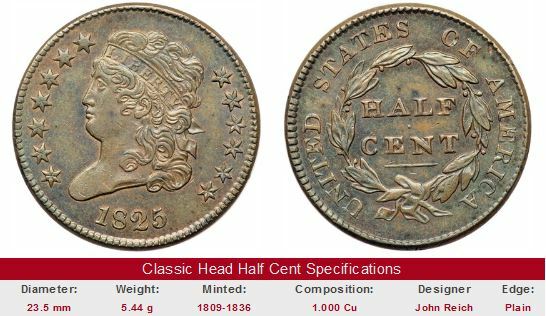 The last of the Half Cents were released in 1857. 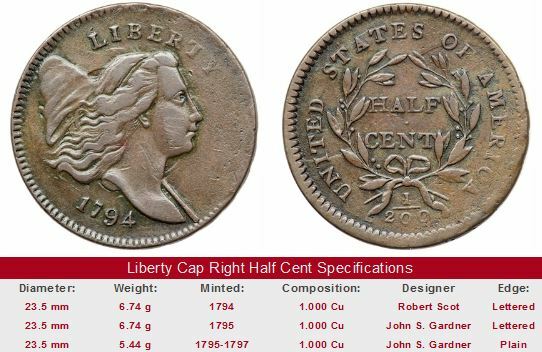 There are five types of Half Cents: Liberty Cap Left (directly below, 1793 only), Liberty Cap Right (1794-1797), Draped Bust (1800-1808), Classic Head (1809-1836), and Coronet (1840-1857). Eli Whitney filed a patent application for his invention, the cotton gin, in 1793. 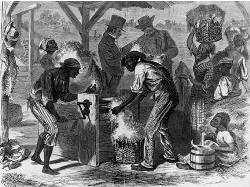 The cotton gin greatly increased the amount of land committed to cotton fields in the South, for it raised the profitability of the crop. Prior to the introduction of the machine, cotton profits were relatively low because of the intensive manual labor required to remove the seeds. Key date Half Cents are offered for sale below. The left hand side of each "Sales Box" is value trend data over a very long period of time for a coin of that date in Good-4 condition. The percent annual increase is computed for comparative purposes. The coin pictured for sale in the right hand side is not necessarily the same condition coin as that represented in the value trend analysis.